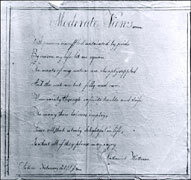 Hawthorne's poetry was limited to verses written in adolescence which he sent to his sisters in letters or published in the newspaper, The Spectator, which he distributed to his family. According to James R. Mellow in Nathaniel Hawthorne In His Times, Hawthorne told his sister, Louisa, "'I am full of scraps of poetry; can't keep it out of my brain'" (22). Mellow notes that Hawthorne reported, "'I could vomit up a dozen pages more if I was a mind to,'" and Mellow observes that these words demonstrate "the same depreciation and irony that were to characterize his attitude toward his work when he became a mature writer-even a famous one" (23). Hawthorne wrote essays as well as poetry in The Spectator, but unlike his poetry, Hawthorne's non-fiction was not confined to his adolescence. Hawthorne wrote non-fiction all of his life, from the early essays in The Spectator such as, "On Wealth," "On Benevolence," and "On Industry" and one book in the juvenile series, Peter Parley's Universal History, through the notebooks, journals, sketches, his biography of Franklin Pierce, "The Duston Family" in The American Magazine of Useful and Entertaining Knowledge and articles for the Atlantic Monthly during his prime, to Our Old Home, his collection of English travel sketches published in 1862, two years before his death.